After lots of fluids including more energy drink and the obligatory Coca Cola I pushed on down the hill. Even though I have done a number of cyclosportives I am still no good at managing my feed stop breaks. I lose more time than most due to stoppages. And today, given the hot conditions I knew I'd be losing even more. I figured I would rather do a slower ride and stay comfortable than skimp on refreshments and end up conking out ! Of course the downside of all of this was I lost my original group and lots of other groups thereafter. I wasn't last, but the groups had definitely thinned out. The next section of the ride was not difficult, but it was a bit of a graveyard section. The scenery around was spectacular with the Lago di Santa Croce and the Bosco di Cansiglio. There was also a beautiful bridge which crossed the main road - it was nice to have something to look at while I was on my own. 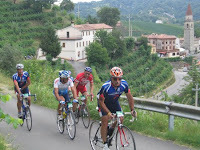 I soon grouped with others just before rolling over the cobbles of the historic town of Vittorio Veneto. Then it was straight up and over the Sella di San Lorenzo. I had a rather embarrassing moment when I walked into a rather swish cafe gagging for a drink. All the customers, who were well dressed looked me up and down as I stood there in my bike kit all pouring with sweat asking for a Coke. Well how was I to know it was a wedding reception !! I took my drink and made a very quick exit. I then had another graveyard period around 30miles from the finish where I had to deal with about 15 miles of straight flat road. If only I could have a hill to jazz things up. Or maybe I'd wished for too much. 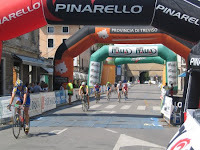 It came in the shape of Presa IV del Montello - a 12% beast that lasted 2km. Maybe not that bad, but try doing that when you have 110 miles in your legs and it's 35 deg celsius. Now I understand why they had a feed station just 16 miles from the end. I wolfed down more Coke, a bit of water and was back on the home straight. 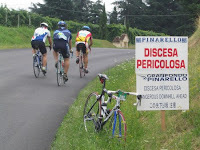 Luckily a group of local blokes - my "sotto roda" friend from earlier in the day instructed me to sit on his wheel and he towed me and the rest of the group all the way back to Treviso. It was great way to finish the course - especially when all the guys in the group sat up and let me do a sprint for the line for 1178th place ! Still, it was a nice gesture from them. I was so pleased to have finished ok - I was happy to have done it in 9 hours - especially as I hadn 't trained specifically for this distance. I needed a few minutes to rest and stop myself being sick from the mixture of various foods and drinks. My fellow cyclist from San Francisco, despite climbing well failed to finish. The heat had been all too much for her. This was a day when even the best of them suffered - across the border, in the French Alps the pros were not having an easy time on their stage from Le Grand Bornand to Tignes. Stuart O'Grady and Michael Rogers suffered nasty crashes, which ended their Tour hopes. Britain's Mark Cavendish couldn't take the conditions any longer. And Robbie McEwan finished outside the time limit after having stopped for treatment for hypoglycamia. It's reassuring to know these guys are human ! I soon found Stanley, who had finished only 40mins ahead of me - wheel rim trouble. All in all, it was a great day out. I managed to find my friend, Yvette from Pinarello. She was happy with her time, considering she'd taken it easy. We then celebrated with a meal at Piazza dei Signori.